A visit to Texas in the winter was just what I needed. The warm temperatures, direct sunlight, and spicy food really took the winter blues clear out of my veins. And what trip would be complete without a sample of the local coffee? Though eager to do so, I really wasn't sure where to start as I had never really heard of GREAT Texan coffee. But after doing a little research, I turned up a few places to try out. One of them was in the lovely town of Houston called Inversion Coffee House. At first when I glanced at their website, I saw "March 5 Grand Opening" on a scrolling marquee and thought that I was going to be one of the first few visitors to walk through their doors only to find out later that they just haven't updated their website in a year (i.e. I almost made it for the first anniversary). 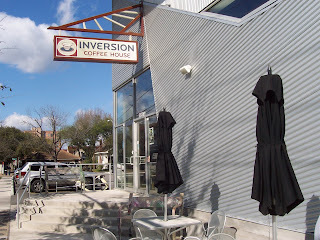 Inversion sits on a mild thoroughfare in a large warehouse-ish building, complete with ample parking, a small garden, and lots of outside seating. The inside is decorated with art of all sorts; some of it really nice and other parts of it just really seemed a bit overwhelming (mainly the pictures peering down from above the register). There's plenty of seating, though much of it was taken when I came in. The coffee comes from Katz Coffee, a local roaster that seems to produce a decent product. The brew on tap at Inversion leaned a little dark and tasted spicy with a sweet aftertaste. The espresso was fair; a dark essence with slight char yet sweet, with a nice acidity. The tea is Revolution. While I really enjoyed my visit to Inversion, they definitely seem like they could take up the quality to the next level. With such a wonderful space and a seemingly great location, Inversion could be a shining star amidst Houston.